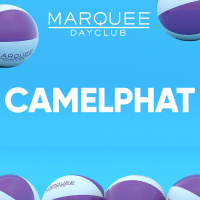 Marquee Dayclub at The Cosmopolitan of Las Vegas spans 22,000 square-feet of the expansive multi-level Marquee Nightclub & Dayclub entertainment complex and boasts two pools, several bars and a gaming... area. Programming throughout the season is highlighted by Marquee Nightclub & Dayclub resident DJs encompassing the world's premier electronic music talent. Exclusive experiences can be had in one of the grand cabanas, which feature infinity edge glass dipping pools, flat screen televisions and dedicated cocktail and food service. The ultimate day to night offering will be discovered in the exclusive bungalows dotting the perimeter of the Dayclub, complete with overnight quarters, individual pools and an open-air party deck. Days spent dancing or basking in the sun are made complete with well thought out amenities while a specialty cocktail and food menu from Corporate Executive Chef Ralph Scamardella fuels the party.